With season four of hit crime drama Bosch, starring Titus Welliver as Michael Connelly's iconic detective, about to drop, it seemed an ideal time to revisit one of Connelly's backlist novels that forms part of the spine of the upcoming season. ANGELS FLIGHT is the sixth Bosch novel (in a series that's now been going for more than 25 years), and it still holds up marvellously well even though it's almost 20 years old. It has a timeless sense that doesn't feel dated, even though technology and other aspects of modern life and the LA setting have evolved and moved on, and underlines Connelly's storytelling talent. The novels begins with Harry Bosch called out in the middle of the night to a crime scene that by rights shouldn't be his. A man and woman have been shot to death in an historic cable car known as 'Angels Flight'. It's the identity of the man that gets Bosch called to the scene: notorious attorney Howard Elias, a thorn in the side of the LAPD who has made a living suing the department. Elias has recently been building a case against several LAPD detectives, and Bosch's bosses want him to take point on the homicide investigation, given all the conflicts of interest involved. A poisoned chalice? Harry fumes that there's far too much politics involved; he might be getting set up as the fall guy if it all turns to custard, and there's the small matter of his two partners being black, so it doesn't hurt the LAPD PR machine to have a couple of black detectives investigating this particular murder, given Elias's ethnicity and that he'd regularly gone after the department for its treatment of minorities. But while many worry about 'optics', Harry has a case to solve, even if it seems like many of those most likely to want Howard Elias dead are Harry's own brothers in blue. This creates some very dangerous waters for Harry and his team to navigate, as the black community seethes at repeated injustices and the city is a powder keg just waiting for a stray spark to ignite into race riots. 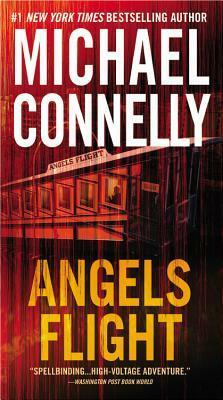 ANGELS FLIGHT is a tremendous read, rich and textured as well as providing page-whirring entertainment. Many of the characters, not just Bosch as the main protagonist, are complex, flawed and incredibly well-drawn. Connelly brings late 1990s Los Angeles to vivid life; the place and its people and the simmering concerns and conflicts that form the capillaries beneath its surface. Connelly has a particular knack for 'telling details', nailing a character or place with a pithy description that brings it vividly to life, rather than pages of details which can lose the impact. This, along with his storytelling, creates pace with depth, and a great sense of forward energy. 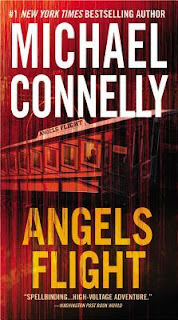 ANGEL'S FLIGHT is a fast read that doesn't feel 'thin', a page-turner with plenty of texture and depth. There's a lovely balance to Connelly's writing: great characters, great sense of setting, relevant underlying social issues as well as personal issues for characters, and good plotlines. In baseball parlance, Connelly is 'a five-tool superstar', someone who is extremely good at a lot of things, not just specialised in one or two. It was a real pleasure to go back and read this earlier Bosch book and be reminded just how great the series has been since its earliest days.